Apple has announced a major overhaul of its iMacs, a new unibody white Macbook, and updated Mac Minis for its holiday lineup. The Cupertino company also unveiled a new wireless multitouch mouse featuring a completely touch-sensitive top side. The company refreshed its line of iMacs today with additional two screen sizes: a 21.5-inch and 27-inch model. They both feature a new LED backlit displays with a 16:9 widescreen aspect ratio. The 21.5-inch model starts at $1,200 (£950) and features a 1920x1080 pixel display. It sports a 3.06 GHz Intel Core 2 Duo processor with 3MB shared L2 cache standard. The new iMac also comes with improved graphics with a choice of Nvidia GeForce 9400M integrated graphics or ATI Radeon HD 4670 discrete graphics. The 27-inch iMac starts at $1,700 (£1,350) and features a 2560x1440 pixel display, which is 60 per cent more pixels than the previous 24-inch model, according to Apple. The larger model sports either a 3.06GHz Intel Core 2 Duo or 2.66 GHz Intel Core i5 quad-core processor standard. It has an option of ATI Radeon HD 4670 discrete graphics or ATI Radeon HD 4850 discrete graphics. Build-to-order options for the 27-incher includes a 2.8 GHz Intel Core i7 quad-core processor. Both the 21.5- and 27-inch models include 4GB of 1066 MHz DDR3 memory, which is upgradable to 16GB across four SO-DIMM slots. Apple's latest MacBook gains a unibody polycarbonate enclosure like the MacBook Pro line, but retains the line's all-white look. Weighing at just 4.7 pounds, the new MacBook comes with a LED-backlit display and a 2.26 GHz Intel Core 2 Duo processor, 2GB RAM, a 250GB hard drive, and Nvidia GeForce 9400M integrated graphics. It starts at $1,000 (£800). Apple says the new battery lasts up to 7 hours on a single charge. The Mac Mini received a minor update for the holiday season in two configurations: a $600 (£500) model with a 2.26 GHz Intel Core 2 Duo processor, 2GB of 1066 Mhz RAM and a 160 GB hard drive. A $800 (£650) model has a 2.56 GHz Intel Core 2 Duo processor, 4GB of RAM, and a 320GB drive. Both use Nvidia GeForce 9400 graphic chipsets. 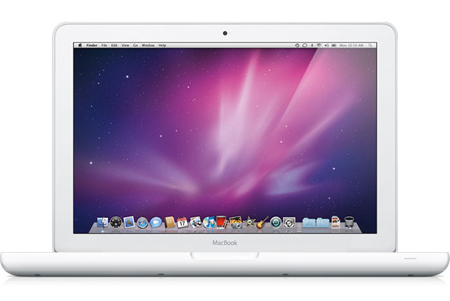 The 2.53 GHz configuration also includes a $1,000 option (£800) that includes Mac OS X Snow Leopard Server and two hard drives. Tuesday's announcement included the successor to the Mighty Mouse, dubbed the Magic Mouse. Apple reckons the wireless device is the first-ever multitouch mouse on the market. The entire top of the Magic Mouse is one seamless multitouch surface. Apple said the technology lets users navigate with "intuitive gestures" rather than mechanical buttons, school wheels, or scroll balls.